"It's a bunch of f***in' back-stabbin' cowards. That's what I found out, just a bunch of f***in' lowlife cowards." Mafia History: La Cosa Nostra—The History of the New York Mafia is an enjoyable, entertaining, and brief history about the New York crime syndicate. Through a collection of interviews with crime historians, anonymous former mob members, law enforcement agents, and old archive footage of America's more infamous mobsters, director Marino Amoruso gives a nice overview of the crime scene. It isn't an entirely comprehensive look at the New York Mafia, since it condenses roughly 100 years of history into a little less than 50 minutes. However, each person gives some nice insights about the way organized crime succeeds. Especially interesting is the claim by crime expert Robert Blakey, who says it is the ordinary citizen that allows the mob to succeed since we're the ones who want the vices that they deal. The most interesting parts of the documentary are the interviews with mobsters turned rats. Each man is hidden by a black dot over his face (though one guy's face is exposed just enough when he moves his head that he could be recognized by former colleagues—let's hope he's still alive). These interviews serve as the primary narrative through the history of the mob, which originated in Sicily and southern Italy. They and others talk about prohibition being what made the Mafia a major menace to America, moving it out of Little Italy and into the world of American business and politics. Some of the names are familiar, like "Lucky" Luciano and Meyer Lansky, while others are not as notorious, like the hit man Albert Anastasia (he is believed to have personally killed more than 500 people!). The highlights of the mob's rise and fall are covered well, though the latter is a bit rushed. John Gotti is not even mentioned until well within the movie's closing five minutes. What is nice to see here are some personal moments:one former mobster, called "Vinny," talks about how he studied the mob's history like it was a religion. In fact, when he became a "made man" a portrait of the Virgin Mary was put in his hand and burned. If he had let go, they probably would have killed him. Another interesting part of the movie is a portion that deals with the stereotyping of Italians. Successful descendents of Italian immigrants, such as former VP-candidate Geraldine Ferraro and Penn State coach Joe Paterno, talk about how the public's perception of them and the use of slurs is very damaging to their psyche. Paterno offers a very thoughtful critique when he says that it is the Italians that have encouraged this stereotype by not making a strong stance against the mob. Obviously the stereotyping of Italians isn't that simple, but there appears to be some truth in Paterno's comment. 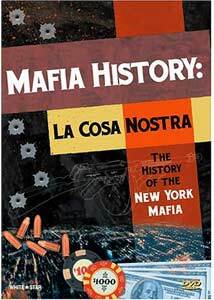 Mafia History: La Cosa Nostra—The History of the New York Mafia is an entertaining overview of the Mafia, though the information and insights here are not new. Instead, this is a nice starting place for further studies in the arena of organized crime. Image Transfer Review: The image transfer is absolutely horrible. The 1.33:1 full-screen picture is poorly rendered, with distracting compression artifacts from start to finish. The contrast of the old footage and interviews is weak and detail is even weaker. Part of this can be attributed to the source material, but the overall murky picture seems largely due to a poor transfer. Audio Transfer Review: The Dolby Stereo sound mix doesn't appear to be any better than a mono mix. There are some hisses and crackles during scenes of old U.S. Congress hearings, but otherwise it's clean. There's nothing lively in the mix, including the music. No sound separation occurs, so the front soundstage is not opened up to its full potential. Extras Review: There are no supplemental materials for this. As an overview of the history of the Mafia, this is a nice starting point. It isn't an in-depth representation, but it has enough history and analysis to support its 48-minute running time. The image transfer is horrible, however, and the sound is not much better.